Here's an odd fact about me: I never leave the house without at least a little bit of makeup on. Ever since I turned 13 and my parents started letting me wear a little bit of mascara, I always wear it when I go out. It’s just one of those things. A couple of weeks ago, I had to have a small procedure done to check up on my migraines. One of the directions was that I couldn't wear any makeup to my appointment. Weird, but manageable. I didn't wear any makeup to my appointment. I went with a totally fresh face. I was a little uncomfortable at first, when I was leaving the house, but after a little bit I realized that it didn't matter how much makeup I was or wasn't wearing. The man who cashed me out at Starbucks didn't care. The nurse who checked me in didn't care. The doctor didn't care. I was the only one who noticed the difference. Am I using makeup as a safety blanket? I'm not trying to impress or attract anyone with the makeup on my face. I like to wear makeup because it makes me feel pretty and feminine. But after my appointment a couple of weeks ago, I had an “aha!” moment. I don’t need makeup to make me feel pretty or feminine. Sure, it helps and I still like it. Trust me, this is NOT a post telling you all that I am going to stop wearing makeup from now on! Dear Lord no. But I am starting to learn to love my fresh face. I have gone out a couple times since without makeup. My made up face is not what defines me, and slowly I am getting more comfortable without the safety blanket on. Do you wear makeup whenever you leave the house? 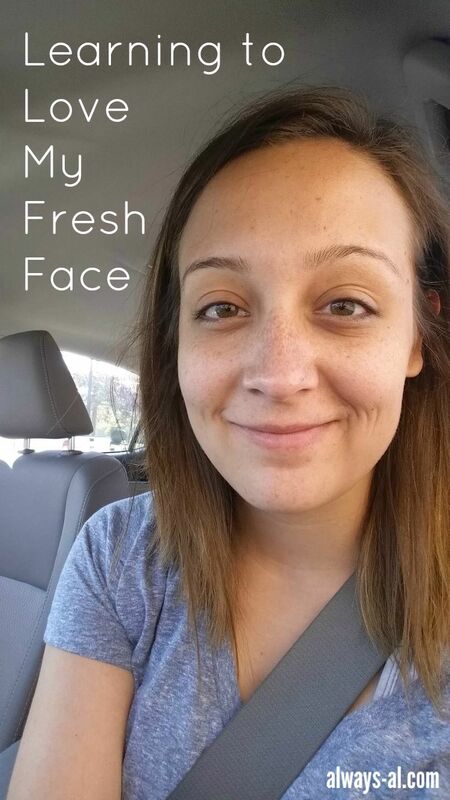 How have you gotten more comfortable going out with a fresh face?